WHO announces with great sadness the death of Dr Mahmoud M.Fikri, WHO Regional Director for the Eastern Mediterranean. The Organization extends its sincere condolences to Dr Fikri’s family and his colleagues and friends throughout WHO and the Eastern Mediterranean Region. Dr Fikri assumed his duties as Regional Director on 1 February 2017. He was on his way to attend the WHO Global Conference on Noncommunicable diseases in Montevideo, Uruguay, when he died. 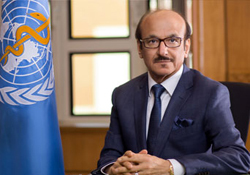 Dr Fikri had served as Advisor to the Minister of Health of the United Arab Emirates from 1996 to 2017, and had been a prominent figure in the field of public health in the Region for many years. He was previously the Assistant-Undersecretary for Preventive Medicine and Health Policies Affairs in the Ministry (1995–2013). He served as a Member of the Board of Directors of the WHO Centre for Health Development (the “WHO Kobe Centre”), Japan, and as a Member of the Advisory Board of the Gulf Health Council for Cooperation Council States (1996–2005). He was also a member of WHO’s Executive Board from 1997 to 2000.